Sorry that the pictures all used alum free instead of ammonia bicarbonate free.. It is a misunderstanding that alum is the same as ammonia bicarbonate. Therefore, please disregard the picture wordings. 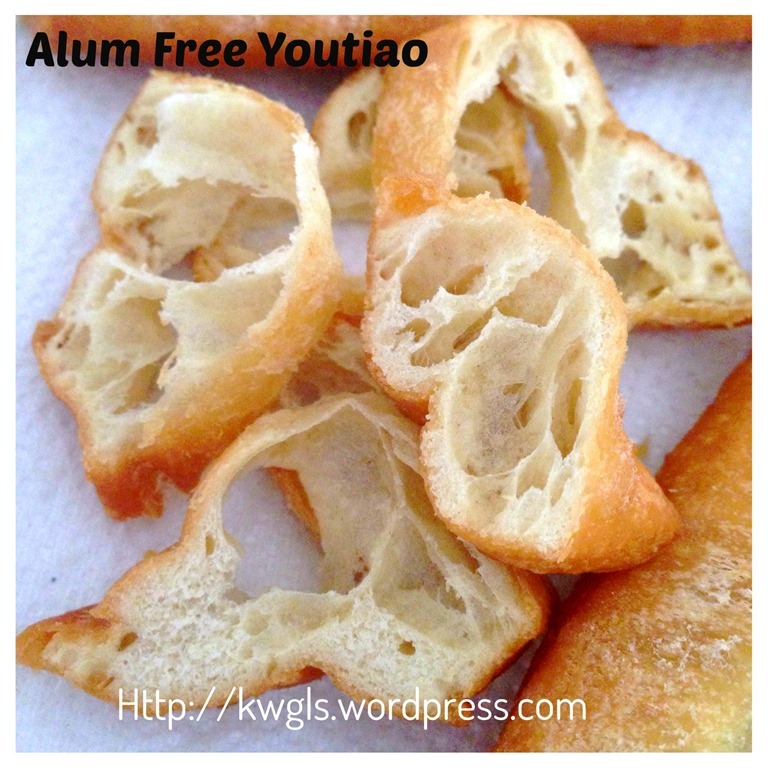 This is ammonia bicarbonate （无臭粉/无嘛尿） free youtiao recipe. 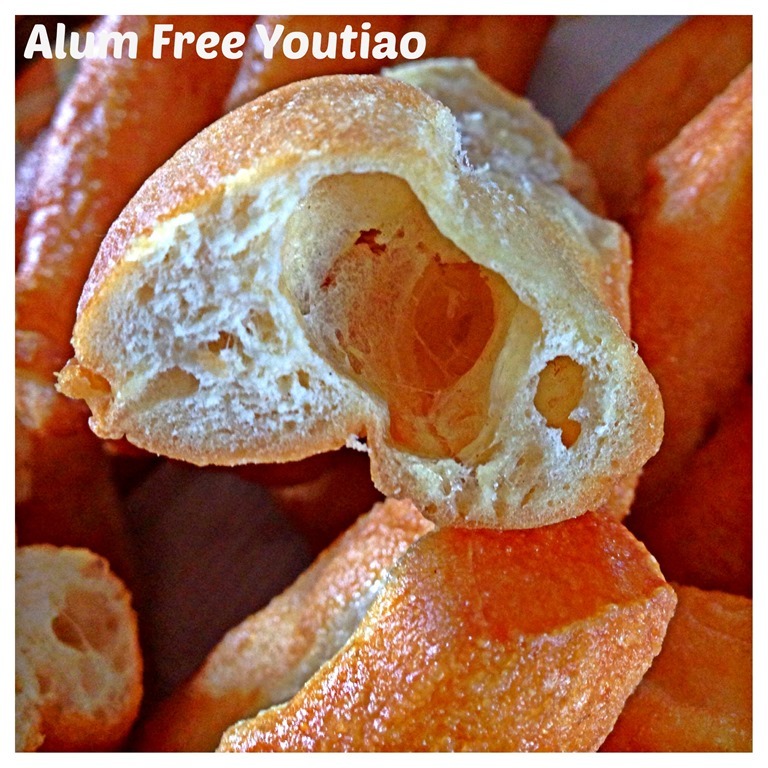 Because there is no ammonia bicarbonate, the youtiao that is prepared may not be as crispy and as puffy as they should be. Ammonia bicarbonate are usually used to improve the texture of the certain cookies and cakes, resulting the dough to be airy and hence crispy. When dough with ammonia bicarbonate is deep fried, ammonia gas will be expelled causing the dough to expand, creating airy structures in the bread stick. However, If not properly deep fried, there will be ammonia gas trapped in the youtiao and therefore occasionally, some youtiao that were purchased will have some foul smell. 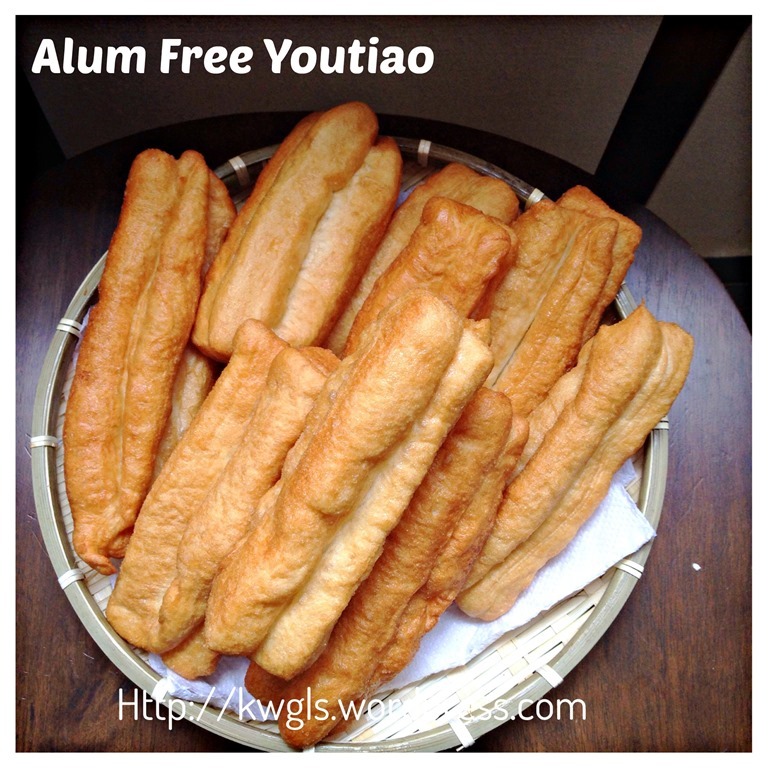 As some overseas members are telling me that they have difficulty to get ammonia bicarbonate in their country of residence, I have decided to try preparing youtiao without the use of this chemical. 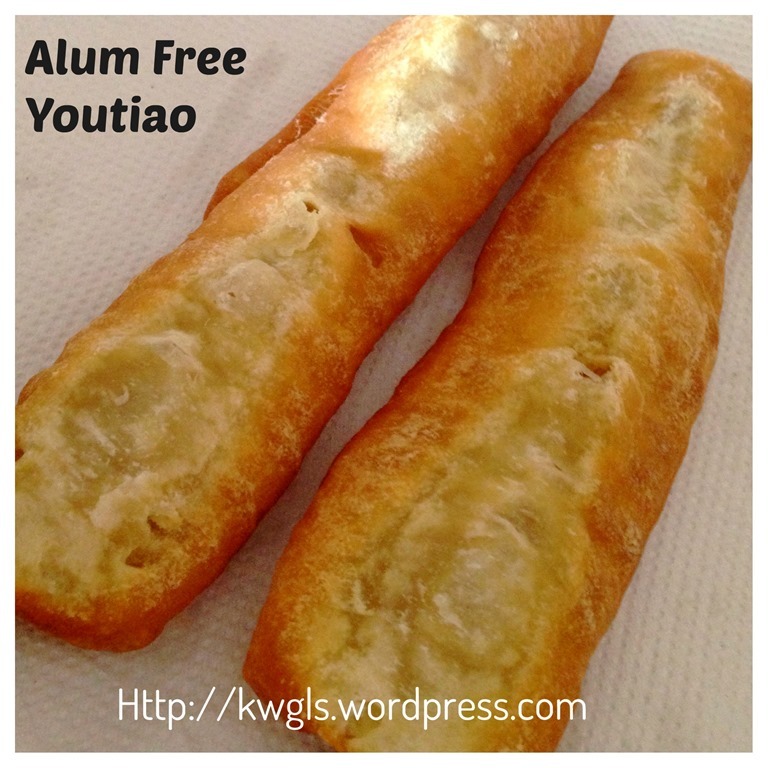 I have been looking for ammonia bicarbonate free youtiao recipe but it is hard to find. Then I came across this recipe from Victoria Bakes on yau cha guai (tips to THE chinese crullers) 自制放心油条, I have decided to give it a try. Though from her recipe, I have amended rather significantly the recipe. 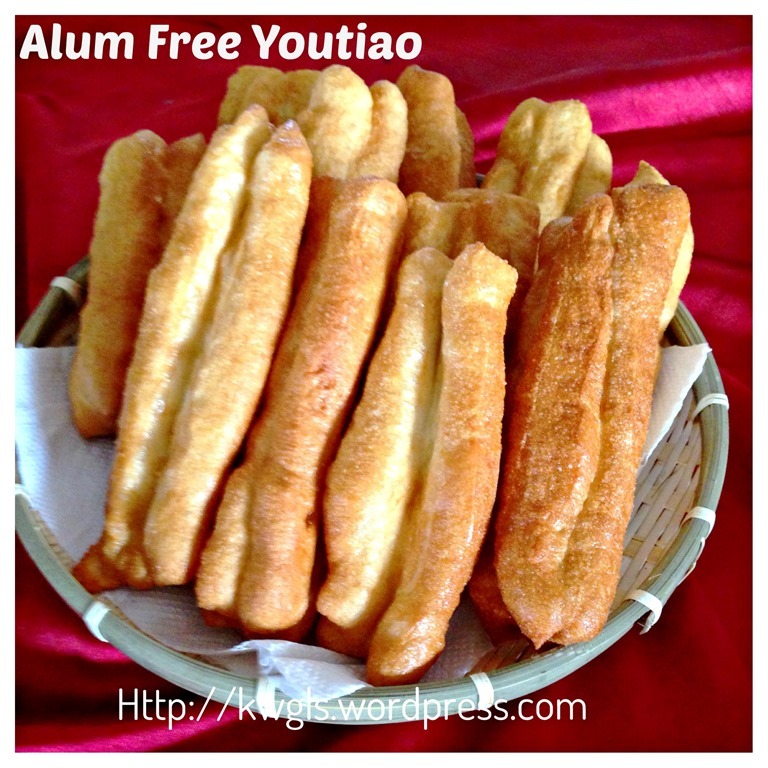 I have added yeast to the recipe with the hope that it will improve the puffiness of the you tiao. I have opted to use double acting baking powder instead of the normal baking powder. 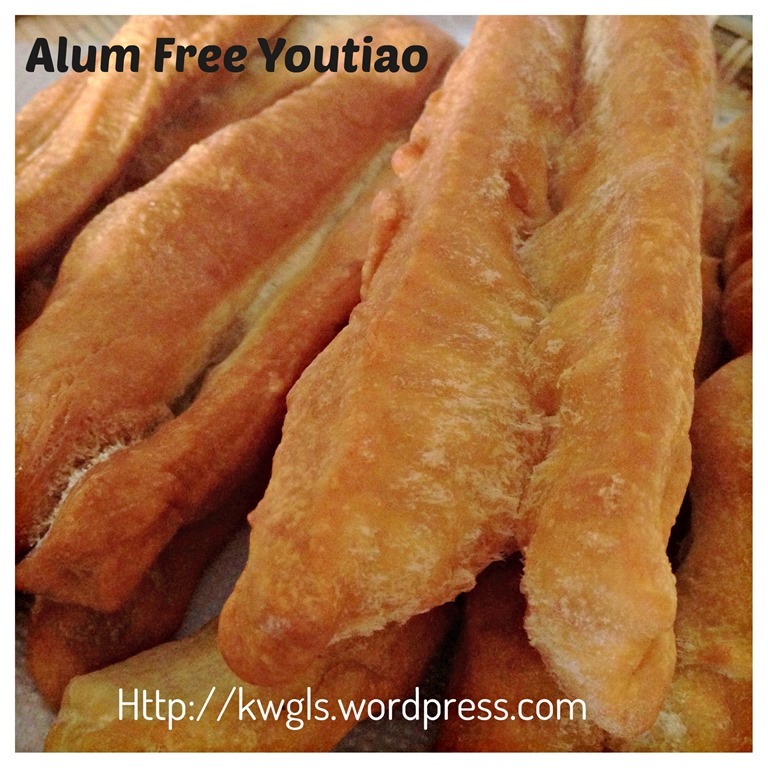 About 80% of the youtiao is hollow in the centre but some are not. I am unsure the reasons as to why the other 20% refused to become puffy. 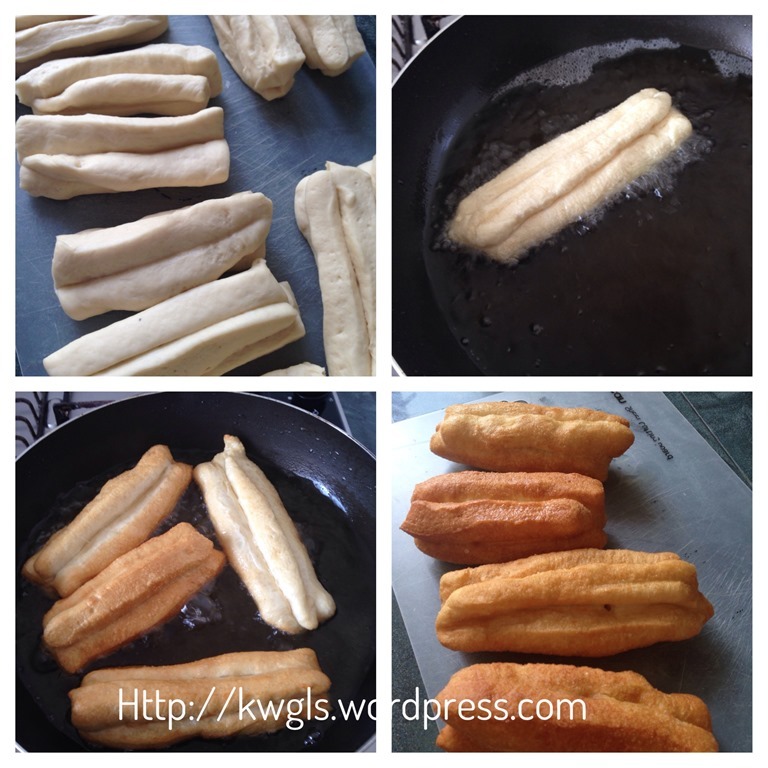 I believed this may not be the recipe’s fault but my imperfections in handing the dough since both Victoria Bakes and another blog My Kitchen Blogspot are able to have their you tiao puffy enough without the use of ammonia bicarbonate. 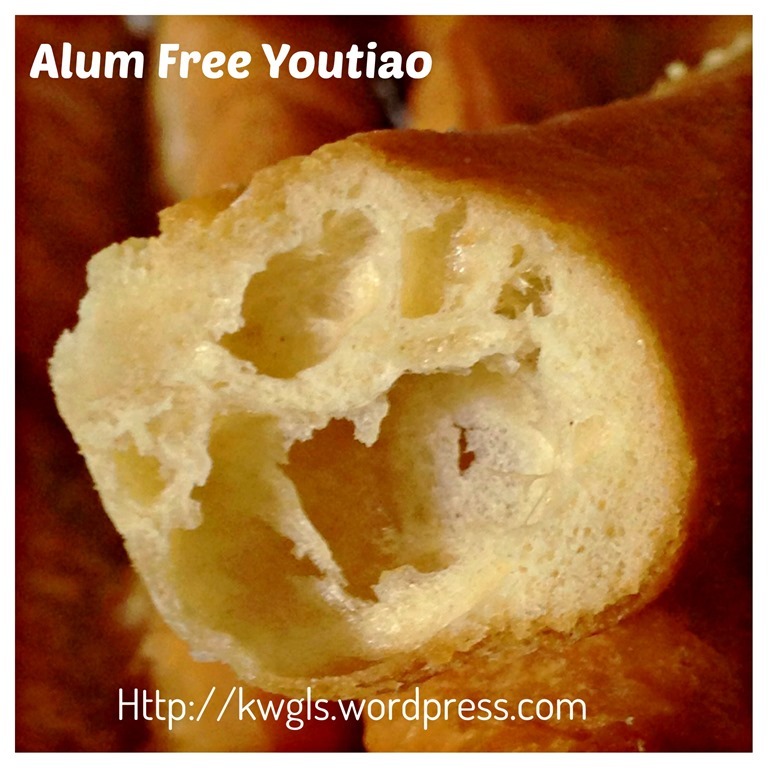 Therefore, there is a great chance that if you follow this recipe, Victoria Bakes’s recipe or My Kitchen Blogspot’s recipe, you will get a hollow and puffy youtiao without the use of ammonium bicarbonate. In a big whisking bowl, put all dry ingredients together. Make a well in the centre, add the eggs and water. Use a spoon to roughly stir until it form a sticky dough. 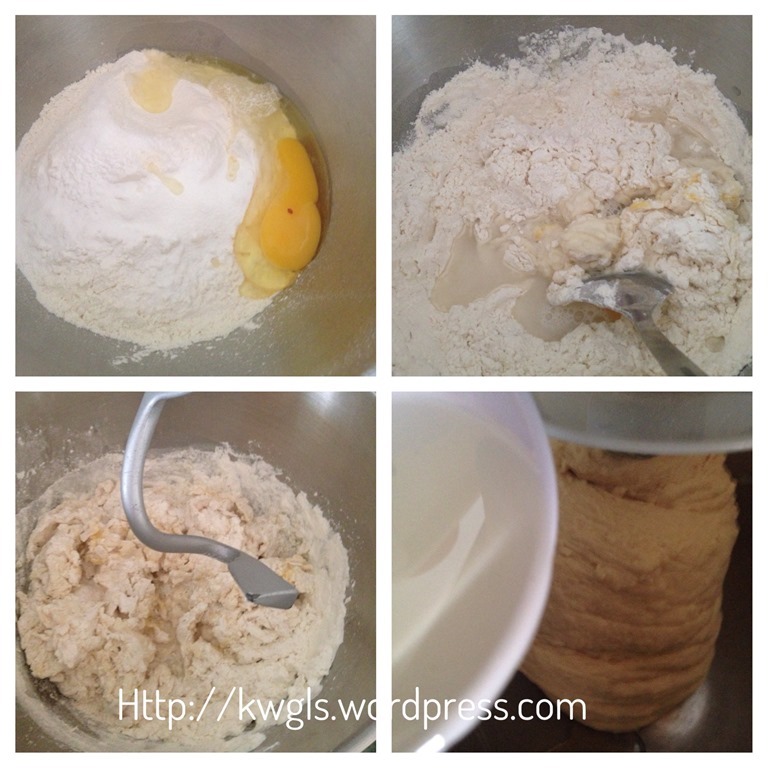 Transfer the whisking bowl to the standing mixer. Use a dough hook and beat the dough at medium to high speed for about 15 minutes until smooth. Add oil and beat for another 10 minutes until all the oil are incorporated. 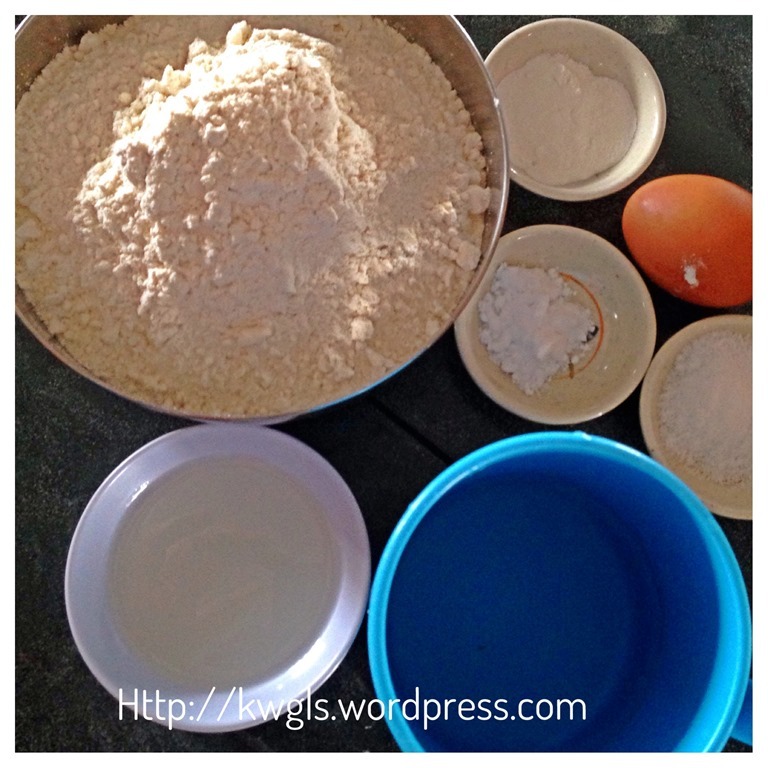 Transfer the dough to a flat surface. Use a rolling pin to roll it in a square.shape of about 0.5 cm thickness. Cut the dough into 1 cm x 6 cm rectangular pieces. Put one piece of dough on top of the other piece of dough. 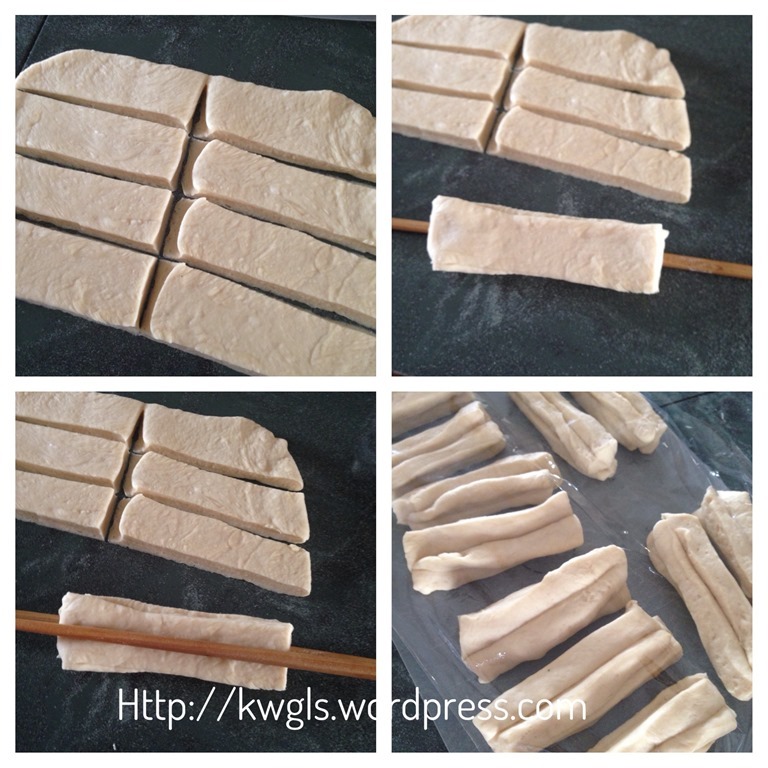 Place the two pieces of dough on top of a chopstick. Place another chopstick on the top of the dough. Press the two chopstick together . Set aside and let it proof until almost double in size (depending on the day’s temperature, it will take about 30-45 minutes). Once the proofing is done, heat a pan of oil suitable for frying. Use a chopstick to insert into the oil, if bubbles start to emit from the chopstick, the oil temperature is considered as hot enough for deep frying. Drop a piece of the proofed dough and deep fry until golden colour. 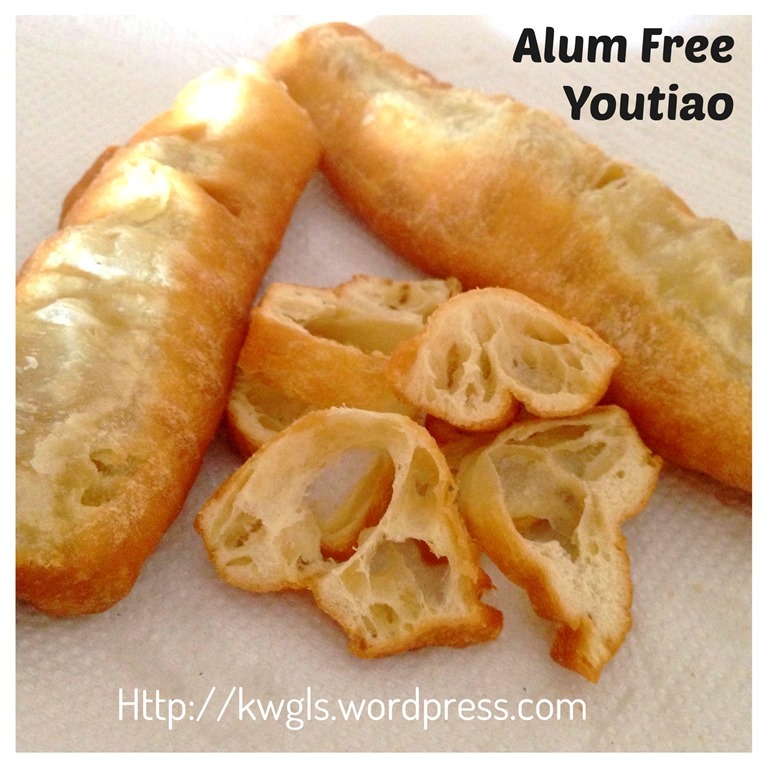 Take out the youtiao and place on a piece of oil absorbing paper. Best served hot with porridges, a cup of breakfast beverages or desserts like tau suan (split mung bean sweet soup). I can’t say this is a fool proof recipe as some of the youtiao are not as puffy as I wanted it to be… However, since two other bloggers (Victoria Bakes and My Kitchen Blogspot ) have successfully done it without the use of ammonia bicarbonate, therefore, there is possibility that the fault is mine..But I do hope that this post will benefit my readers who do not have a chance to get hold of ammonia bicarbonate in their country of residence and this, I believed this will the next best alternative for them to try out. let it rest for 20 minutes after the dough is kneaded, thereafter shape and deep fry. 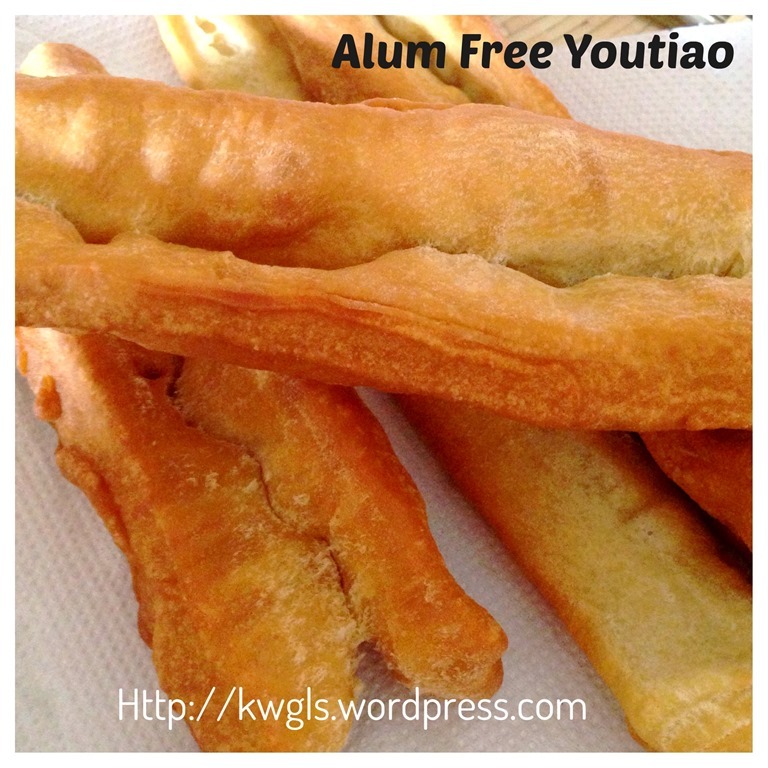 This modified recipe will be able to provide you the crispy and puffy youtiao like the youtiao that you purchased in the stores. For more recipes, you can refer to myRECIPE INDEX (updated as at 3 March 2014) here and you can follow me at PINTEREST or visit this blog’s FACEBOOK PAGE . If you are a Pinterest user and you are interested to have more recipes, you can join or follow this Pinterest Board set up by me where there are more than 1500 recipes worldwide and pinned by various bloggers:FOOD BLOGGERS AND FOODIES UNITED PINTEREST BOARD. You can also join the Food Bloggers and Foodies United Group Facebook Group to see more recipes. 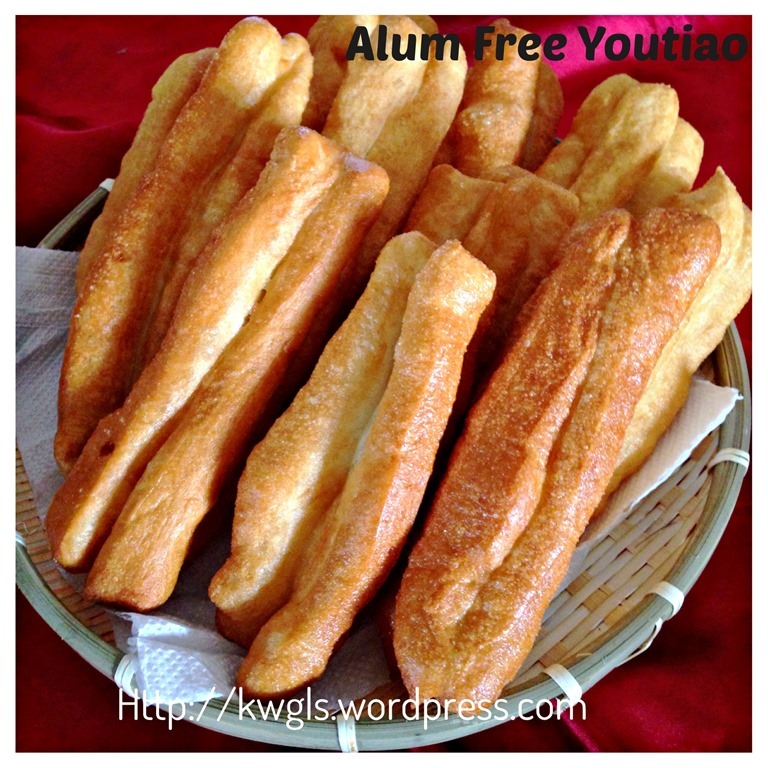 This entry was posted in Chinese and Asian Cakes and Snacks, Food Preparation Series and tagged 8, Alum free youtiao, Chinese bread sticks, Chinese crullers, Chinese Hollow sticks, GUAI SHU SHU, Guaishushu, kenneth goh, postaday, you char kuay, you tiao, youtiao, 油条. Bookmark the permalink. Thanks for posting this recipe! However, alum and ammonium carbonate are not the same chemical. Alum can usually be found in the spice aisle of US and Canadian stores as it is used for pickling. Ammonium bicarbonate is harder to find, but there are many on-line sources such as King Arthur Flour Co in the US. Both alum and ammonia bicarbonate create the supper crisp, shattered shell which is characteristic of a true youtaio. The ammonia smell dissipates with heat. Youtaio that have the ammonia taste after frying have either not been cooked long enough and/or the dough is too dense and the gas is unable to escape. Thanks for highlighting, deeply appreciate your sharing. Double-acting baking powder includes alum… that’s the second part of the mix. So this recipe includes alum. 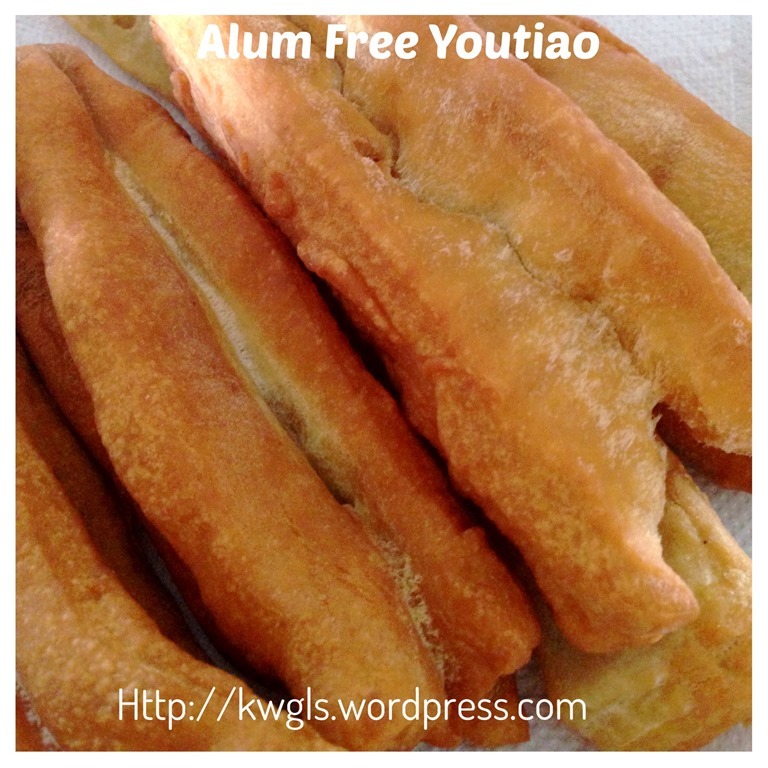 You don’t put yeast in a you tiao – you’ll get a doughnut. Thanks for your sharing. I will rewrite the post soon. Alum is not ammonium bicarb. Alum is hydrated potassium aluminium sulfate. This is what you find along with sodium bicarbonate in double action baking powder, which is what you suggested to use here. Thanks for sharing. When times permit, I will rewrite the post. Hi, my husband love you tiao that why i try to learn. I do many kind of baking, amonia, yeast…but the result look like fry bread. I want share to you this receipe. Very good and look same in asian. Put (2)in (1) and mix well and beat in mix standar 5 min leave it 20 min with cover. After that knead again 5 min them wrap it put in warm place until 4 hour or over night. Then you cut and fry.